Stream channels can be straight or curved, deep and slow, or rapid and choked with coarse sediments. The cycle of erosion has some influence on the nature of a stream, but there are several other factors that are important. 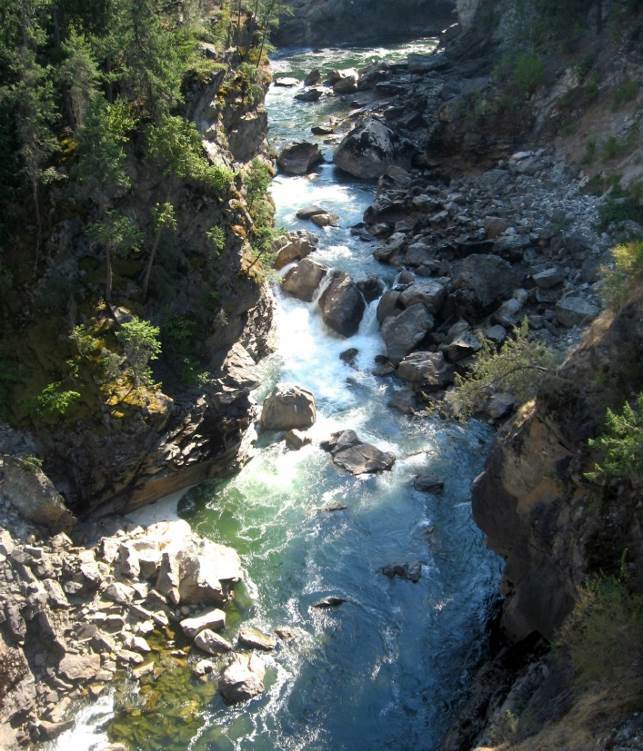 Youthful streams that are actively down-cutting their channels tend to be relatively straight and are typically ungraded (meaning that rapids and falls are common). As shown in Figures 13.1 and 13.18, youthful streams commonly have a step-pool morphology, meaning that the stream consists of a series of pools connected by rapids and waterfalls. They also have steep gradients and steep and narrow V-shaped valleys — in some cases steep enough to be called canyons. In mountainous terrain, such as that in western Alberta and B.C., steep youthful streams typically flow into wide and relatively low-gradient U-shaped glaciated valleys. 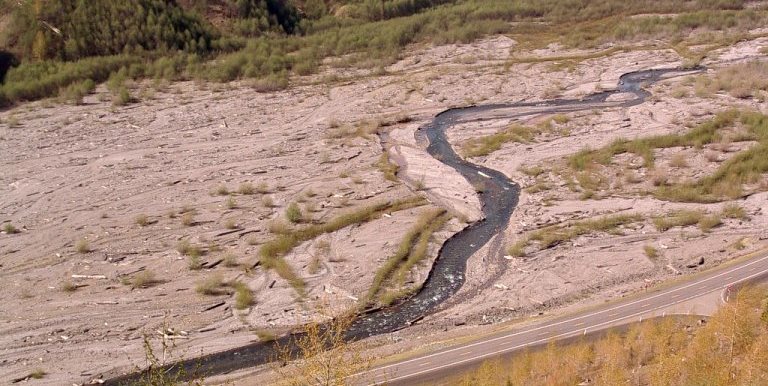 The youthful streams have high sediment loads, and when they flow into the lower-gradient glacial valleys where the velocity isn’t high enough to carry all of the sediment, braided patterns develop, characterized by a series of narrow channels separated by gravel bars (Figure 13.19). Braided streams can develop anywhere there is more sediment than a stream is able to transport. One such environment is in volcanic regions, where explosive eruptions produce large amounts of unconsolidated material that gets washed into streams. The Coldwater River next to Mt. St. Helens in Washington State is a good example of this (Figure 13.20). A stream that occupies a wide, flat flood plain with a low gradient typically carries only sand-sized and finer sediments and develops a sinuous flow pattern. As you saw in Figure 13.14, when a stream flows around a corner, the water on the outside has farther to go and tends to flow faster. This leads to erosion of the banks on the outside of the curve, deposition on the inside, and formation of a point bar (Figure 13.21). Over time, the sinuosity of the stream becomes increasingly exaggerated, and the channel migrates around within its flood plain, forming a meandering pattern. A well-developed meandering river is shown in Figure 13.22. The meander in the middle of the photo has reached the point where the thin neck of land between two parts of the channel is about to be eroded through. When this happens, another oxbow lake will form like the others in the photo. 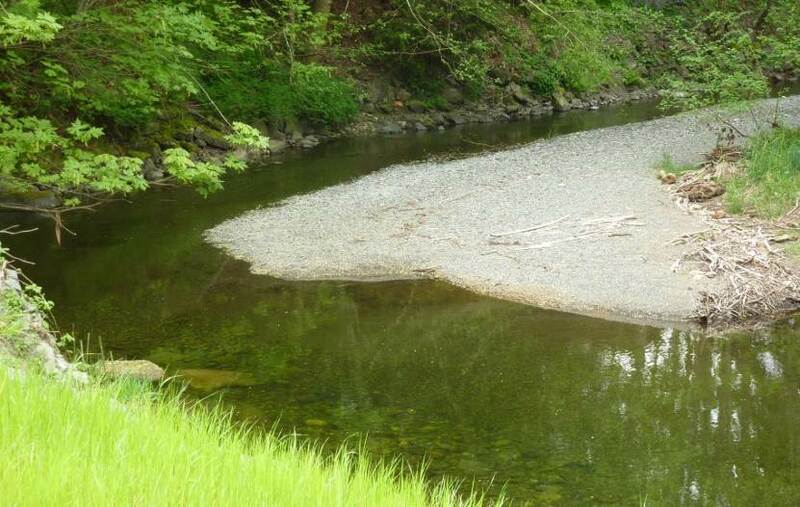 Gradient is the key factor controlling stream velocity, and of course, velocity controls sediment erosion and deposition. 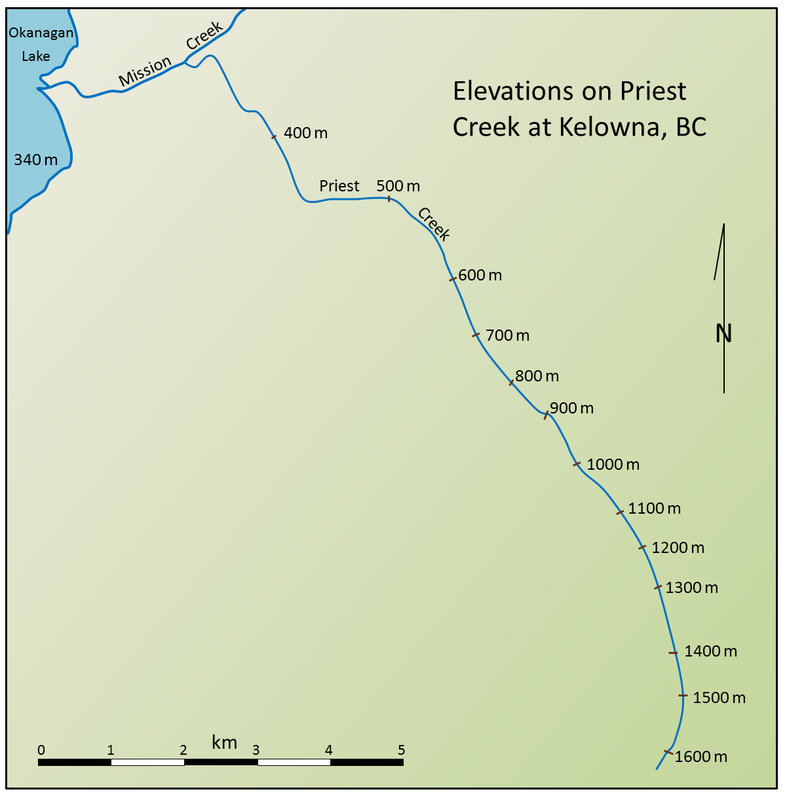 This map shows the elevations of Priest Creek in the Kelowna area. The length of the creek between 1,600 m and 1,300 m elevation is 2.4 km, so the gradient is 300/2.4 = 125 m/km. 1. Use the scale bar to estimate the distance between 1,300 m and 600 m and then calculate that gradient. 2. Estimate the gradient between 600 and 400 m.
3. Estimate the gradient between 400 m on Priest Creek and the point where Mission Creek enters Okanagan Lake. 13.4 Stream Types by Steven Earle is licensed under a Creative Commons Attribution 4.0 International License, except where otherwise noted.